For a new store in Bal Harbour, Miami, Valextra selects the studio ArandaLasch to design a space steeped in Milanese craftsmanship. The initial inspiration for the project were the entryways of Milan’s palazzos: gates, lobbies, and corridors connecting the indoors with outdoors, the metropolitan chaos with domestic intimacy. Similar to these liminal spaces, ArandaLasch presents an environment of distinctly Milanese materials and attention to detail. 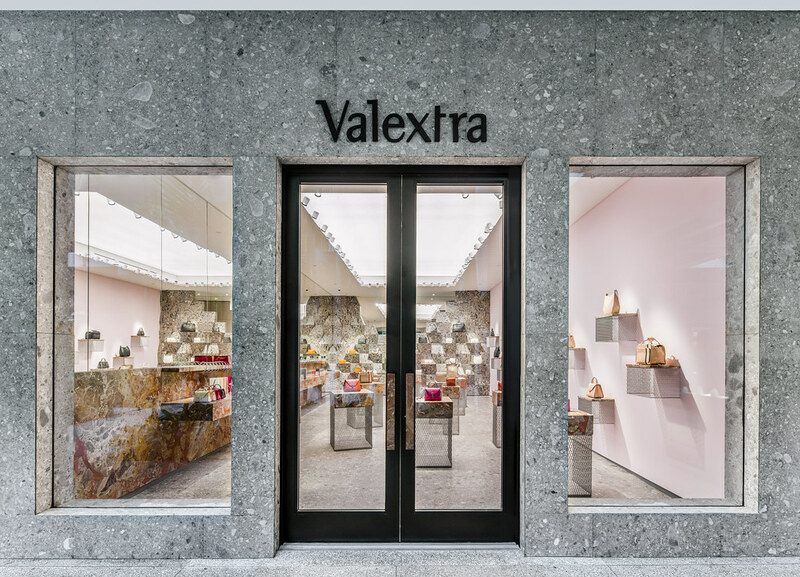 Valextra is rooted in its Milanese history, the detailing of their products is unparalleled in its execution, they are sophisticated in their understatement but at the same time sensual in their colors and patterns. This Milanese tradition serves as the direction for the project’s design and material explorations. Visitors first encounter the design approach in the façade clad in the city’s signature porous stone, Ceppo di Gre. Inside, the store reinterprets the fundamental elements of a classic palazzo lobby: marbles, metals, rare wood and reflective surfaces, all presented in a combination of sophistication and abstraction. The Valextra collections of leather goods are displayed on stone pedastals which combine Arzo marble blocks (the same material which can be found in the Via Manzoni, Milan, flagship) floating on a light metal mesh. The metal is a common industrial material made graceful through a reflective polish and meticulous detailing. The heavy Italian stones appear to be floating on a net. Monolithic marble shelves flank the space and provide a canitlevered surface for display and storage of Valextra’s small leather goods. One distinctive feature of the store is a long metal coil to organize the leather products. Beyond, the display in the back is designed as two wing walls clad in Alpi laminate by Ettore Sottsass. The composition is typical of Aranda/Lasch: geometric modules whose repetition creates an effect reminiscent of crystals and minerals. To complete the atmosphere, a fabric ceilling softens the light alongside hidden spotlights, a combination typical to a museum or art gallery. Overall there is a simplicity in the details with a maximum material impact. It an environment that is contemporary and flexible, fluid and refined, that emphasizes the small Valextra masterpieces as exemplars of Milanese craft.